You might remember, I’ve told you before about the spectacular U-shaped Zafarraya Pass (El Boquete de Zafarraya) marking the boundary between the provinces of Málaga and Granada, and which can be seen for miles around. 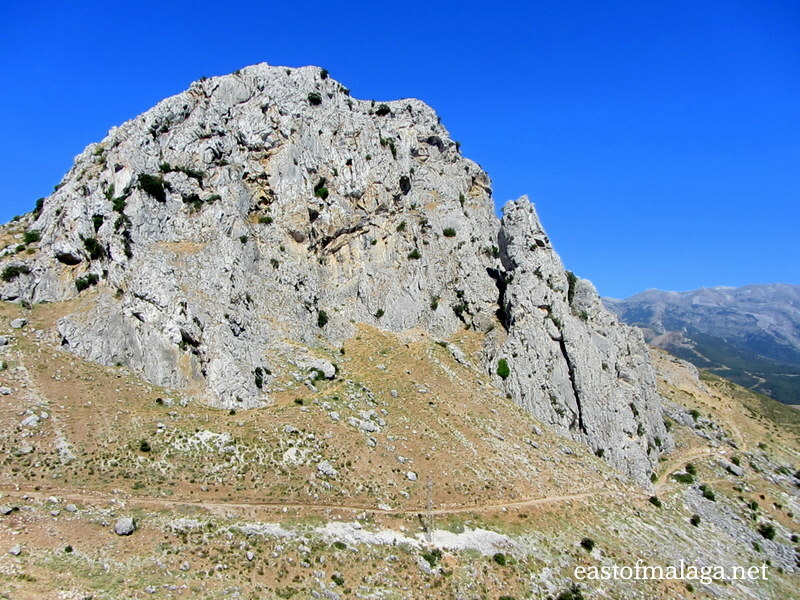 Standing over 900 metres above sea level, the Pass has been used for centuries as a key route through the sierras, linking lands south-west of Granada, with the towns and villages along the coast, east of Málaga. On the approach to the gap in the mountains, above the road on the left, a small tunnel through the rock can be seen. 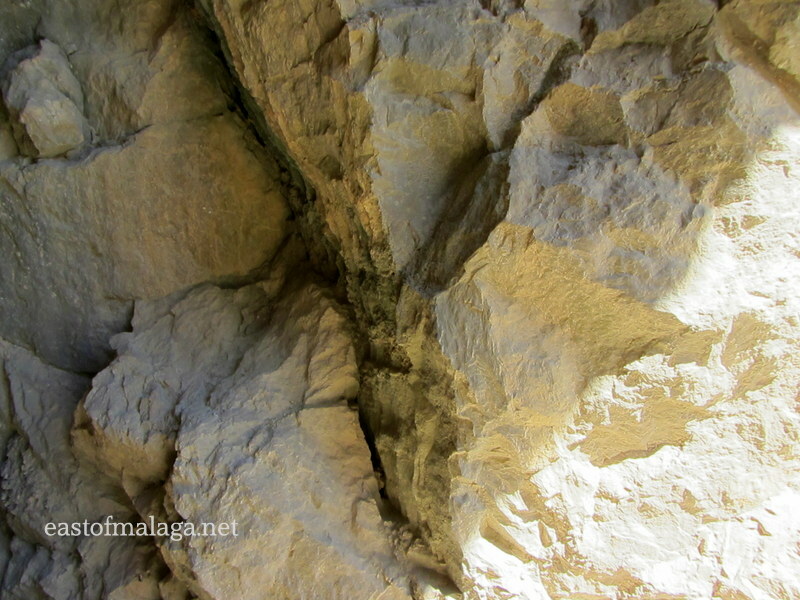 This once formed part of the Periana to Zafarraya railway line, abandoned fifty years ago. 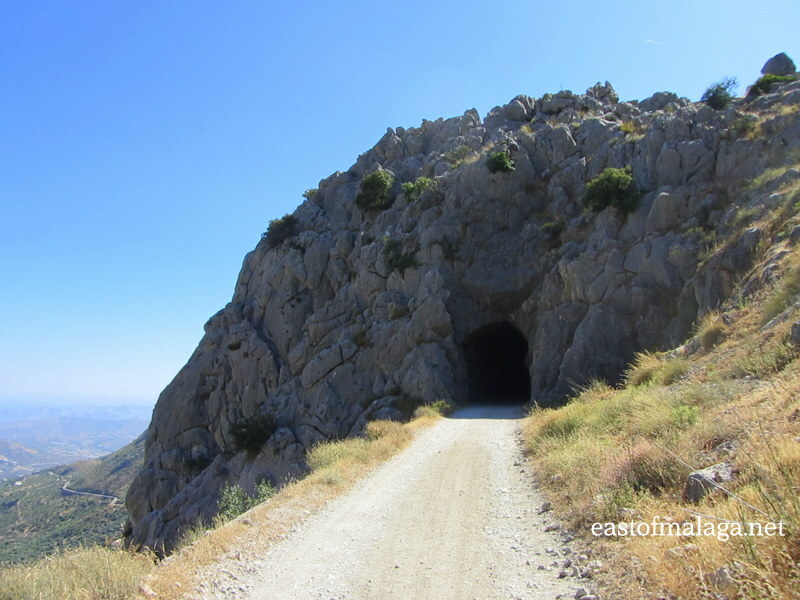 The tunnel is now used by horse-riders and walkers who enjoy strolling along the dirt road where the railway once ran. Last time I went through the Zafarraya Pass, instead of whizzing by, I decided to stop and have a look. After driving under the the old iron railway bridge, I parked in the small car park on the left side of the road. It’s only a few steps up the gentle slope to where the narrow gauge railway once ran. The main tracks were removed long ago, but there is still a short length remaining to illustrate what it must have looked like. 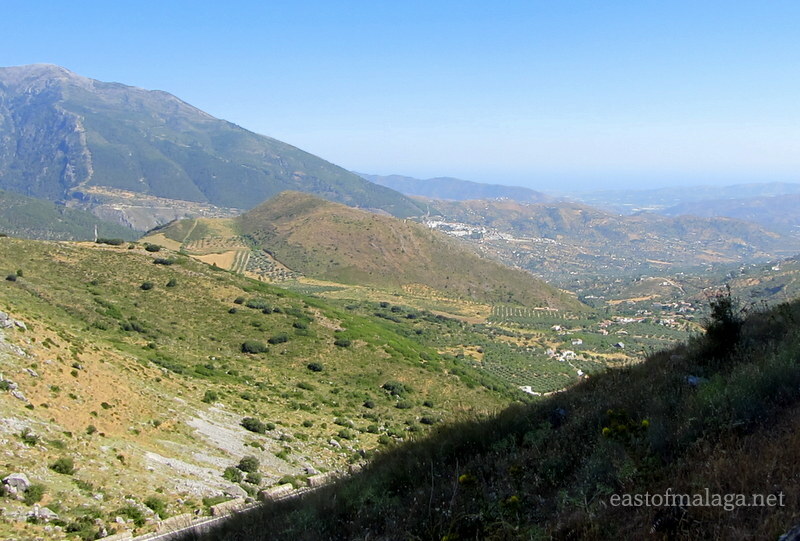 The views from the Mirador El Boquete (lookout point) both across the Pass and down towards the coast are stunning. This is a lovely peaceful place to stop for a picnic, and there are a couple of picnic tables for public use. From here you can see the peaks of Tajo de la Cueva and El Morron de La Cuña, the hamlets of Espino, Los Cortijillos, Los Pavitos and Los Morales as well as numerous white houses, dotted like paint spots on a canvas, as far as the eye can see. The village of Alcaucín and the Parque Natural lie ahead, overseen by La Maroma, the highest mountain in the Axarquía region at 2066 metres. 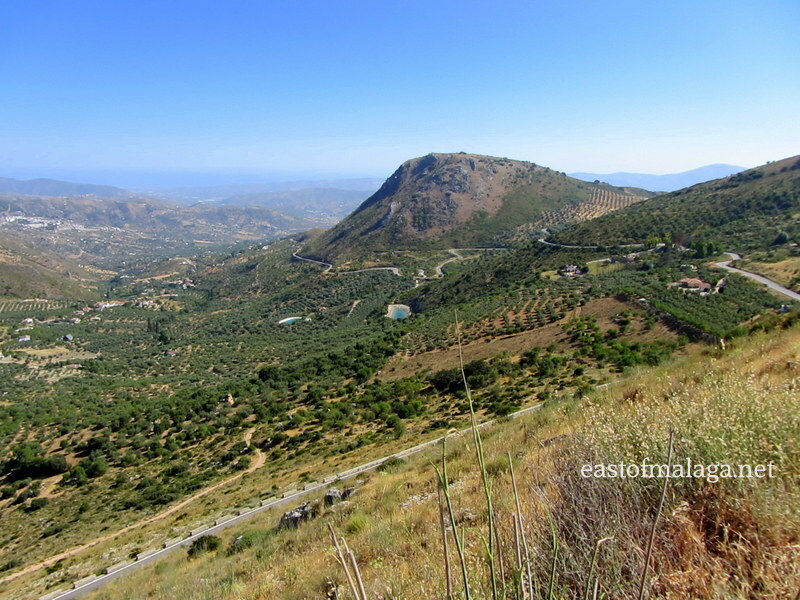 If you cast your eyes further down the valley, La Viñuela reservoir and the Mediterranean Sea glimmer in the distance. 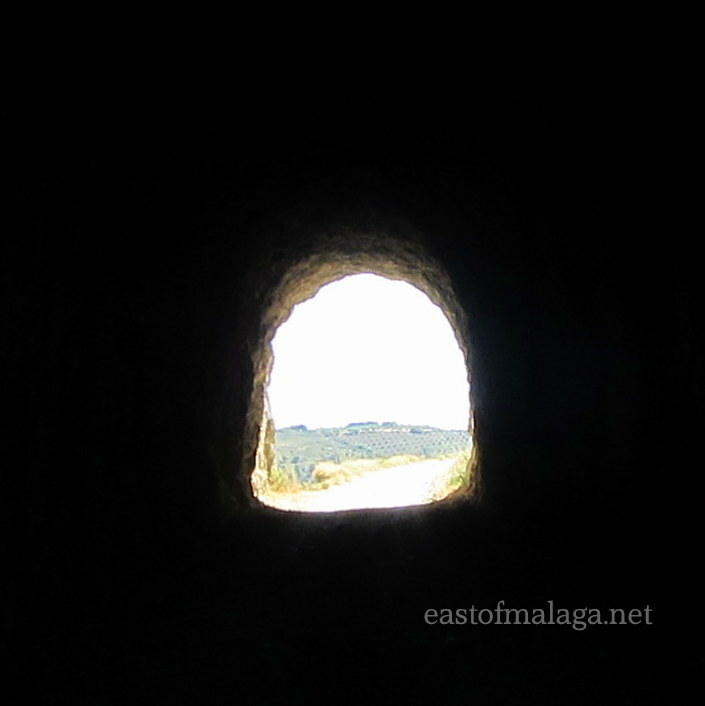 I wandered along the dirt track, and ahead of me I could see the old narrow railway tunnel. As I approached, the enormity of the task in building the tunnel was obvious. It had been hewn through the rock by hand. What a job! 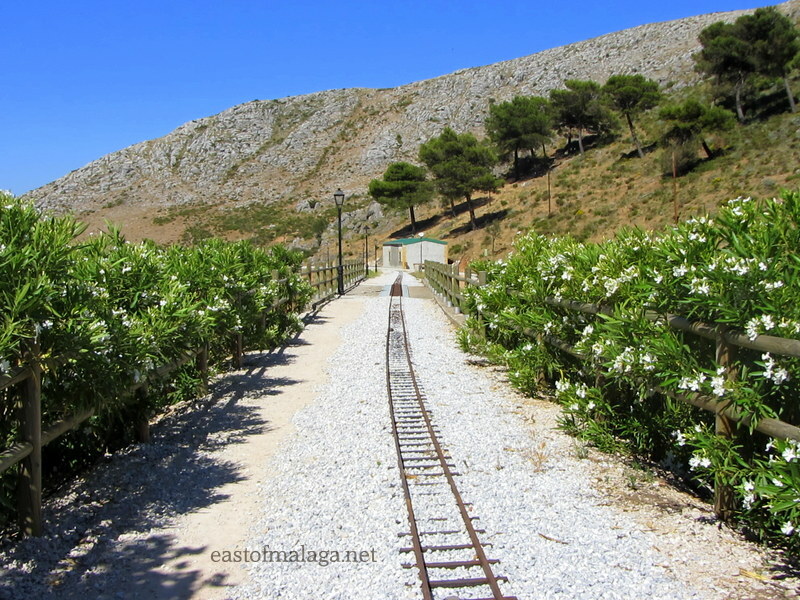 Rather than just strolling as I did, and depending on how fit you are, you might enjoy an adventurous walk or a more gentle ramble from Periana, the source of the old railway line, back to the Boquete de Zafarraya. Whatever you choose, be sure to watch out for the fabulous birds. 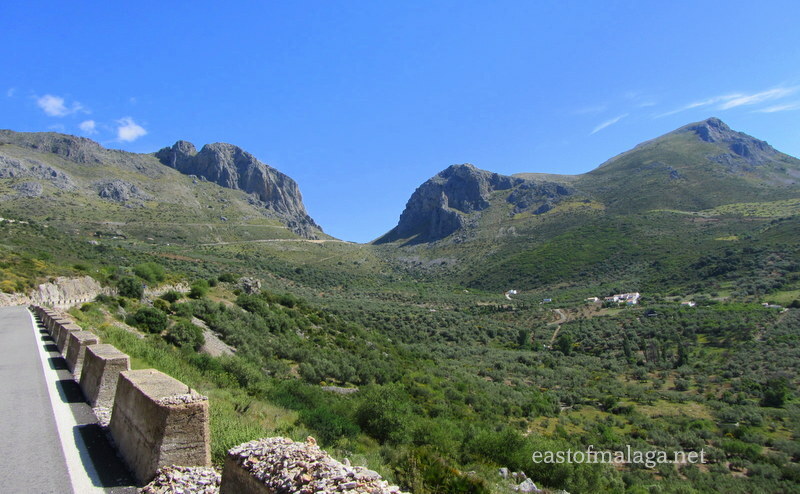 To get to the Zafarraya Pass, drive north from the A7/E15 Autovía del Mediterraneo, past the town of Vélez-Málaga and briefly alongside Lake Vinuela, before heading up the A402, a winding mountain road. You will see the gap in the mountains ahead, getting closer and closer the higher you climb. Where do you enjoy walking when you need to find some peace and quiet? This entry was tagged Andalucía, East of Malaga, Europe, history, life, Malaga, photography, railway, Spain, travel, walking, white villages. Bookmark the permalink. Hi, I have just read your report about Zaffaraya – I have walked a little of that rail track before I was confined to my wheelchair and was wondering if you know of any places – other than the long promenade at Torre del Mar – that would be suitable for me. 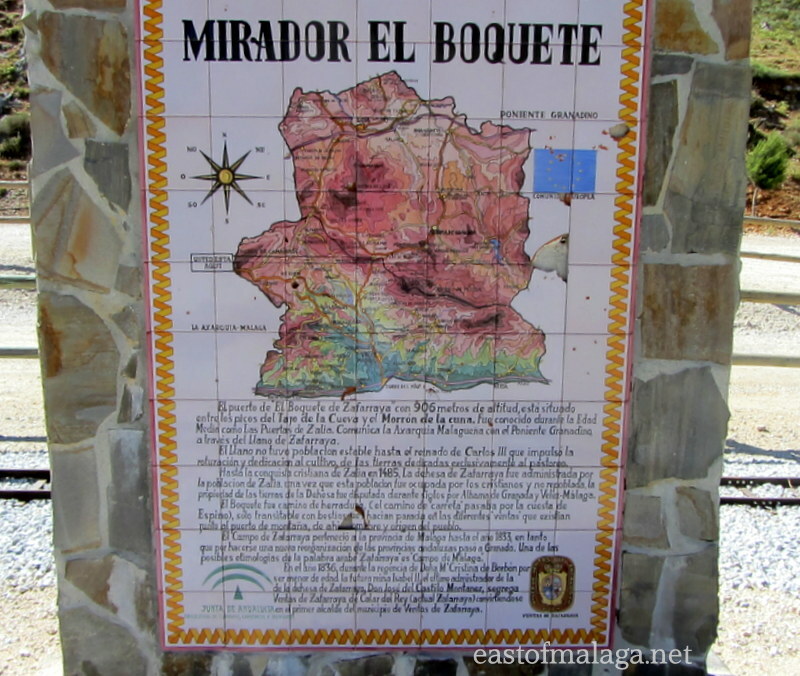 I live in Benamocarra – near Velez-Malaga and cannot even get around my village. Sorry to hear of your difficulties – you’re right, there are not many areas of flat land around here, that’s for sure. I love the promenade at Torre del Mar, though. 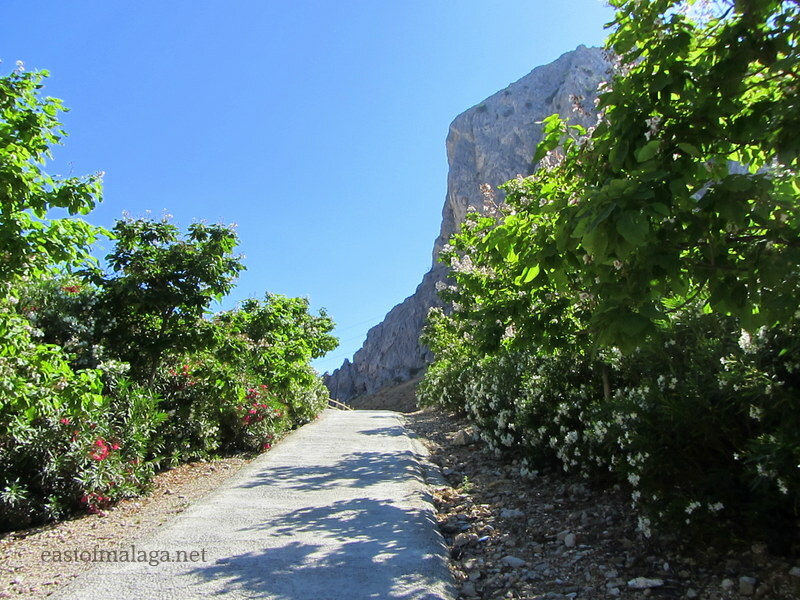 There is a nice, paved promenade at Torrox Costa or you could try out Marina del Este (the boat marina between La Herradura and Almunecar) or how about the promenade down at Rincon de la Victoria – through the old railway tunnels? These are all flat, picturesque and have cafes or restaurants to hand. Let me know how you get on, won’t you? Hi, many thanks for your response. Rincon de la Victoria sounds interesting – we have never thought of going there. We have been to Torre, and walked all along to Mezquitilla; Torrox Costa; and Benajarafe many times. It will be good to explore somewhere new. We did find the Marina once and then I’m sure it was moved as we just kept going round in circles the next time! Many thanks again and I shall let you know how we get on. We don’t go to Marina del Este very often, and like you, sometimes think it’s a bit difficult to find, but it’s worth persisting. 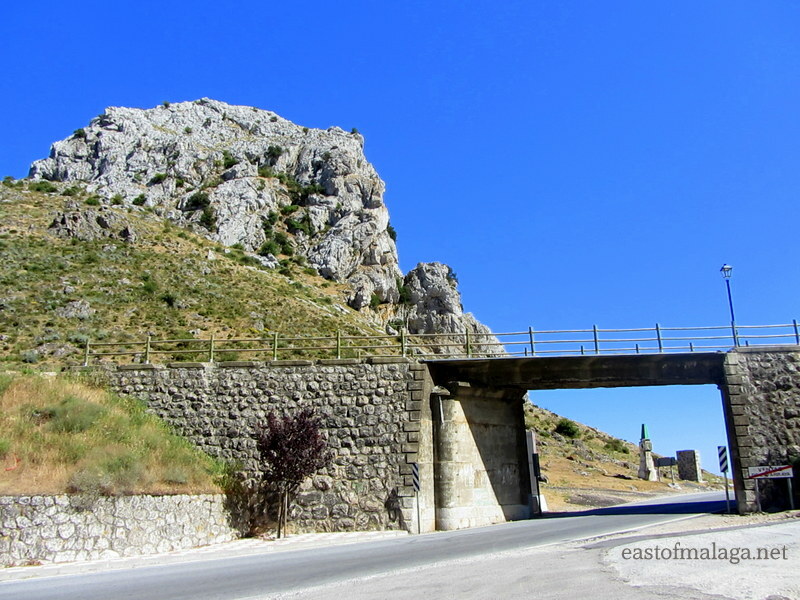 All I can say is that it’s off the old N340 coast road – after the La Herradura turn-off, but before Almuñecar. Once you turn off the N340 there, it’s always worth stopping for the views across the lovely horse-shoe bay of La Herradura. What an amazing pass! And the views and landscape, just stunningly beautiful. Thanks for a fun adventure. Have a great weekend. Wishing you and your family a blessed New Year. What a beautiful area you live in Marianne. Rich with culture and history. Your photos help preserve that. What a lovely thing to say, Lynne – I’ve never thought about it that way before, but you’re quite right. Blog posts and online digital photographs not only help to preserve such culture and history but are a fantastic way to share it with others, throughout the world, who might never know anything of it. That’s good to know, Barbara. Thanks for that. Just be aware that the restaurant is closed on Fridays! I didn’t know about the model railway group – so thanks for adding that information. Thanks for giving a photographic tour – great images, wonderful scenery, looks a great place to get away from it all! I always enjoy (and look forward) to visiting this area. It’s very peaceful. Waking up this morning in grey old England, little did Big Man and I expect to see such a wonderful post about part of his home town – thank you, this has made our day! Ah yes, I remember you saying that BM heralded from Ventas de Zafarraya. Glad to be able to brighten your day! Thanks for the great tour, great photos too. Now that is what I call narrow gauge! Shame that these old lines have gone. Last year I tried to find the old Catalonia coastal railway but didn’t realise that it had gone! Yes it is – especially as there are no others in this area, because of the mountainous terrain. Sad that so many railway lines are lost but they do make fabulous walks! The logistics of the gradient of this railway line made it so difficult. 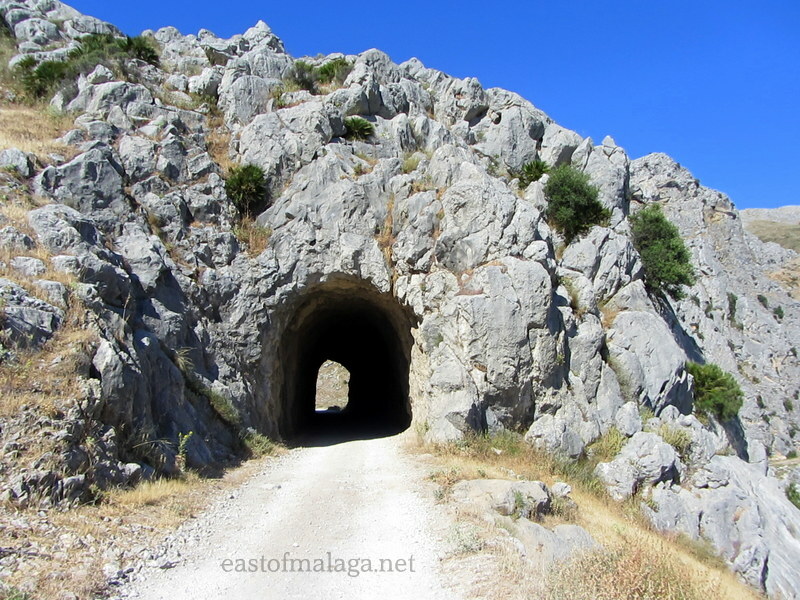 It’s a shame, because there are rail lines to the west and north of here, but not to the east of Malaga. Great photos Marianne! 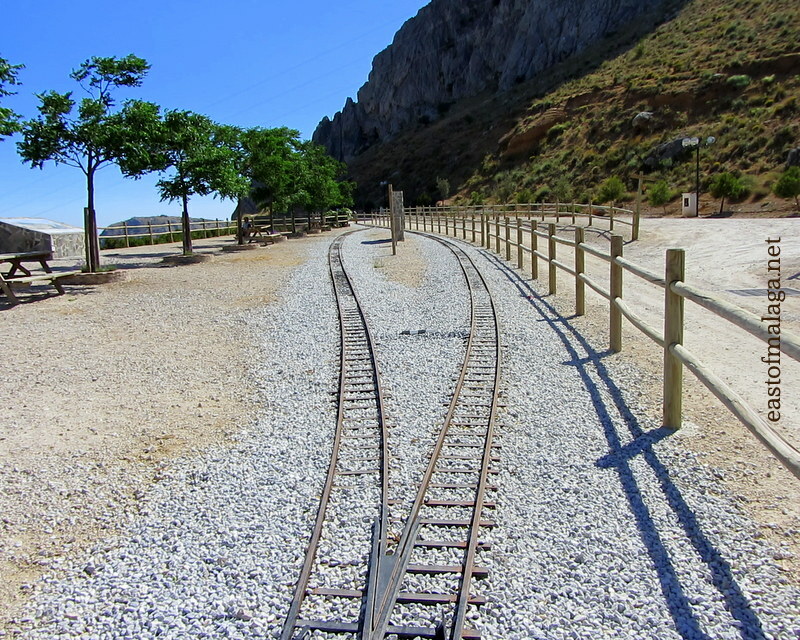 Looks like a lovely walk…..we have a couple in Valencia and one in Murcia although without the tracks! The tracks only run for a couple of hundred metres to give the impression of what it once looked like. The rest of the walk is just a dirt track. It’s a perfect place to get away from things and enjoy nature.